Gulf Insider honours the top Non Residential Indian (NRI) leaders in Bahrain on the occasion of India’s 70th Republic Day celebrations. 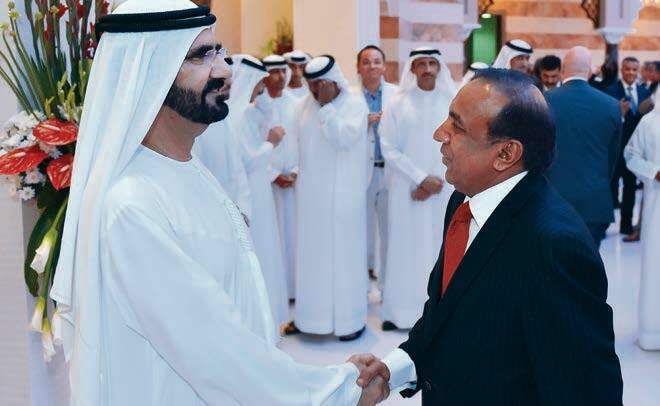 On this regard, Gulf Insider meets with Dr. Ravi Pillai Chairman of RP Group Bahrain, whose vision and hard work have intensified the unique relationship between India and the Middle East. RP Group of Companies has played a major role in the economic development of the Middle East and India for four decades. The company stands as a prominent example of India-Middle East relationship with 20 affiliated companies and businesses in 9 diverse sectors of Industrial Construction and Infrastructure, Real Estate Development, Hospitality, Tourism, Trading, Retail, Education, Health Care and IT. Dr Ravi, why did you choose Bahrain to base RP Group? A reasonable portion of our Oil and Gas Industrial Contracting operations are in Saudi Arabia, which is managed out of our setup in Eastern Province of the Kingdom. Bahrain has always offered a great link to this setup and also to our operations in rest of the countries. It is considered the gateway to the GCC due to its strategic location in the centre of the Middle East and provides convenient connectivity to the region. However even more importantly, I have always found the Bahrain Government and the community in Bahrain to be very supportive and conducive, both on a personal and professional level. The Government of Bahrain and the warm and friendly people here have always shown us their support and solidarity since the day we set foot in the Kingdom. The Bahraini Government has also taken several initiatives to create a Business Friendly environment in the Kingdom. The institutional framework here makes investment and growth possible with relatively lower operating costs. It is also a powerhouse of skilled workforce in addition to being a great place to live and work for expatriates that makes Bahrain the ideal choice for any business. What are your current and future projects in Bahrain? Our on-going project is the ALBA Plotline 6 where we have employed more than 3,000 employees. The Line 6 expansion project is one of the largest Brownfield expansions in the MENA region. We will be also joining hands with BAPCO for their upcoming $5bn modernization project. Due to the large scale investments from Government initiatives in Bahrain, it will certainly give a strong boost to Bahrain’s economy in multiple ways, including real estate. We have already made investments on the Real Estate sector in Bahrain, and also considering more in months to come. We are also looking to invest more in the education sector. We already have a presence in this sector through New Millennium School – DPS, and I think Bahrain’s placement as a regional hub has the potential to attract highly rated educational institutes. I can already see that Bahrain has a strong primary education system in place and I believe this sets the tone for welcoming high-end academia through top-ranked Universities and Institutes. We are also involved in vocational training through our company in Australia. We have already brought this company to KSA, and successfully implemented vocational training in the region by establishing skill-building centres in KSA. The next step is to add programs offered and expand the operations to rest of GCC, including Bahrain. Another focus area for RP Group is the IT Sector. Bahrain has already shown a warm welcome to transformation through ecosystem to support IT, and I am looking forward to introducing my Tech initiatives to join the Kingdom’s foray in this sector. I’m also open to more investment ideas as I’ve mentioned that Bahrain has a unique advantage as the region’s central hub and its business-friendly environment and supportive government. How do you see the future for Indian expats in Bahrain? The relationship between Indians and Bahrainis goes back several generations. Our nations have been closely connected for centuries and we have developed a strong bond with each other. This age-old association has led the Bahraini and Indian communities to have blended into each other on political, socio-economic and cultural levels and we continue to march forward hand in hand. My own group is an example of the interconnectivity between Indians and Local Community. We have around 150,000 employees where expatriate as well local workforce come together to deliver very highly demanding projects, to the satisfaction of most stringent industrial contracting requirements in the world. We were recently awarded by Saudi ARAMCO’s In Kingdom Total Value Add (Iktva) Program which recognizes prioritization of domestic value creation and integration of localized talent, which makes us a proud employer, and testimony of Indian and local community coming together to deliver world-class results. I wish to recreate a similar setting all over the GCC including Bahrain and support the local talent while ensuring that we deliver the best results to our clients. I also sincerely endorse the findings of the 2018 HSBC Expat Explorer Survey which ranked Bahrain as the No. 1 best place to live and work for expats. This itself is a testimony to the levels of freedom, respect and openness enjoyed by Indians and other communities in Bahrain. The kindheartedness and generosity of the Royal Family and the Government of Bahrain allows Indians and other communities to feel at home with a strong sense of safety and security. I can personally testify to this through my personal experiences as I have many friends in Bahrain that are like my own family to me. I do not think the rest of the world knows enough how great of a place Bahrain is to live and work. Do you see that Bahrain is diversifying its economy? The Kingdom’s attempt at diversification is nothing new and years of efforts are now being recognized globally. I have been travelling all over the world for over 3 decades, and I see a high level of acceptance and awareness of Bahrain’s initiatives in various fields. While Bahrain strongly continues its investment in the oil and gas sector, an equal amount of effort is put in various other sectors. For instance, ALBA’s expansion program is a good example of the diversification. Bahrain continues to be a gateway for the rest of the world and I can see a lot of focus on developing the travel and tourism sector with many attractions being designed to appeal to foreign travelers, starting from building the new airport. Some of the best international brands are already here or are trying to establish a foothold in Bahrain. Many luxury resorts and world-renowned hotel chains have already entered the island and are competing for a viable spot. There is also a lot happening in the Technology space with Amazon recently selecting Bahrain as one of the AWS regions and other advances in the Fintech arena. All of these show positive signs for Bahrain’s economy. EDB, Tamkeen and other Government Agencies are working very effectively to support new initiatives and empower & supporting the youth with training and entrepreneurship skills. It makes me very happy to see such an enriched ecosystem being developed in Bahrain and I commend the Government on building such a strong vision for the future of the country. You have hotels in India and UAE. When will you venture into the hospitality industry in Bahrain? My venture into the Hospitality industry begun as a passion project to build a world-class hotel in my hometown in Kerala. From there, I invested in several other projects such as the Raviz Leela Kovalam – our flagship property, which is today, one of the most sought-after holiday destinations in India and globally. As of now, we have four five star luxury hotels and resorts in India and three five star luxury hotels and resorts in Dubai. Through these hospitality initiatives, my main aim was to showcase the Best of Kerala – its unique culture, the wholesome and flavorful food and speciality Ayurveda treatments to the rest of the world. I am still rather young in the business of hospitality. It is an exciting industry and I am further evaluating growth plans out of which Bahrain could be a potential option in the future. What do you most like and dislike in your business? I always like to see the happy face of my employees. The greatest satisfaction to me comes from meeting all my commitments – making sure all my employees are safe and well taken care of, all my vendors are paid on time and of course, my clients by giving them the highest quality work in the fastest possible time and at the best commercial terms. With more than 100 million Safe Man-hours without Lost Time Injury project execution, our group has received numerous international awards and accolades for excellence including ExxonMobil’s global Best Contractor award and Samsung’s Best Partner Award globally. Likewise, what I dislike is when my I see the threat of commitments not being met on time. If we are not progressing as per the desired schedule – this is something I will never accept. Fortunately, I am blessed with a committed and skilled workforce who have always exceeded the client’s expectations. Due to this reason, we have been able to gain a good reputation in the market. If we had failed even one job, we would have lost all credibility. Getting a good name is very difficult, but losing your reputation is very easy. I would rather lose money than reputation. What do you consider will be the impact of VAT on Bahrain’s business sector? Value Added Tax has been applied in Saudi Arabia and UAE since the beginning of 2018 and there hasn’t been any major impact on our operations in these countries. Additionally, the structure of VAT is Bahrain is quite reasonable as real estate, basic necessities and school fees are exempt from Tax. I rather feel that VAT will bring more efficiency in the business world and more opportunities for efficient organizations. For instance, our core operations run on SAP ERP, which has helped us manage the change swiftly with the least disruption. I have seen the positive benefits a strong internal infrastructure which ensures a smooth transitioning and does not create much of negative impact either operationally or commercially. VAT is applicable in more than 160 countries all over the world, and many of those countries have a lower Per Capita income that GCC countries. I feel that this step would have a net positive impact in the long term for everyone. What are the most satisfying projects for you so far? Me and my team always put complete heart and soul into every project that is undertaken. All the work that we do, is directly linked to the strategic development of the nations and visibly contributes to the national economy. It takes no less than all your commitment to live up the stringent standards required to deliver the results. If I take you around the oil & gas infrastructure in the region, you will be amazed to see the complexity of the jobs executed by us and there is an immense sense of satisfaction you feel once you deliver these important high-value projects. Over the past 40 years, our team has delivered several significant turnkey projects and you will find it very difficult to choose from among them. Having said that, I would like to highlight a few recent projects undertaken by our Industrial Construction division in the GCC, namely Saudi Aramco’s JAZAN Refinery Project, KNPC’s Clean Fuel Refinery Project and the Sadara Project which is the world’s largest chemicals complex built in a single phase with 26 Plants which are mega- projects due to their rigorous demand for the highest level of their quality and safety. How do you find time to relax while managing all these demanding business sectors? In truth, there is no time to relax as much as I want to do so. There are 150,000 employees working in RP Group companies all over the world and I am responsible for each and every one of them. When you invest all your energy and passion into your work, your relaxation comes from seeing the results of your efforts – seeing the job getting completed on time with the best quality, the highest level of safety and the happy faces of your employees around you. What do you dream for the future of RP Group of Companies? We continue to be are on a growth path in the Middle East as well as globally. I see opportunity in the Oil & Gas Sector in GCC for the next at least 7 – 8 years and continue to invest in our core business in the Middle East. A bulk of our operations are undergoing a progressive change, more than a disruptive change and we continue to align ourselves with the various technological, industrial, political and socio-economic changes that impact us. We have plans to invest in our other group verticals and continue to look for growth opportunities. My Son, Ganesh Ravi Pillai, who has worked with Citibank and completed his MBA from IE Business School, Spain has joined the business. He has been listed as one among the 100 next-generation business leaders and young professionals from India in the Middle East and Africa. My daughter Dr. Arathi Ravi Pillai is currently doing her Masters in Medicine and would also be soon joining me. I look forward to handing over the reins of the business into their capable hands. Together, I am confident that they will take RP Group to the new and higher realms. 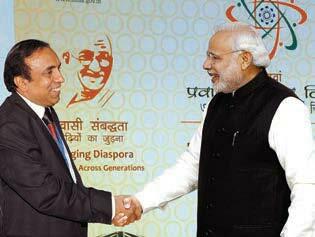 Dr. Ravi Pillai renowned for his numerous contributions to CSR activities. The RP Foundation, a charitable foundation, works under the ideology that ‘Serving the poor equals serving God.’ RP Foundation’s activities have so far assisted many people in need of rehabilitation, education, medical situations and to eradicate poverty to a significant portion. The foundation also assists the funding of thousands of marriages for underprivileged couples. 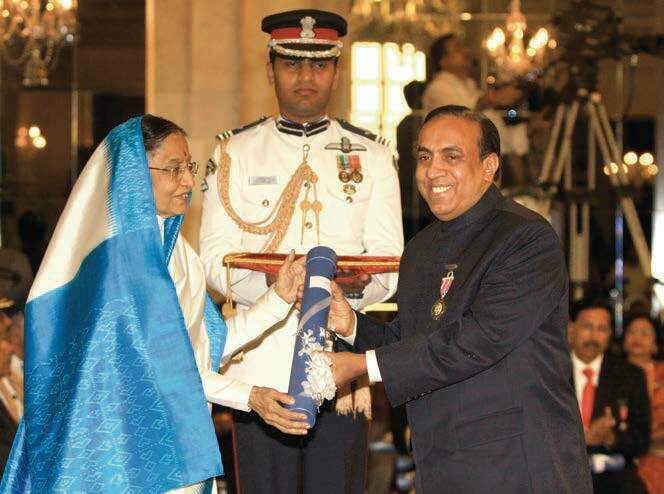 The Indian Government honoured Dr. Ravi Pillai with the Hind Ratna Award in 2003, the Pravasi Bharatiya Samman Award in 2008 and the Padma Shri in 2010.